I'm still on the them of food, when I said our fridge was packed with freshness, I wasn't kidding. We currently have tomato salad, carrot salad and fruit salad at arm's length; tasty veggie packed goodness ready to grab whenever someone has the hankering for a snack. Last year I posted some ideas for using up the summer rush of zucchini, and to this day zucchini "noodles" are my favorite. They hold the right texture of an al dente noodle, but no bloated gut from wheat overload. None of that crazy blood sugar roller coaster from carb overload either. How do you make zucchini noodles? Find a baseball bat sized zucchini (or a bunch of reasonable sized ones) and wash and peel it. Run the vegetable peeler lengthwise down the zucchini, creating ribbons of the fleshy part. Stop when you get to the seedy core. Now you have a giant heaping of zucchini ready to lightly saute in olive oil. Do a bit at a time so you don't break or chop the ribbons into small pieces. You want them sturdy and as spaghetti-like as possible; only saute until the ribbons get just tender. Season as you go, I use salt and garlic but season according to your tastes. 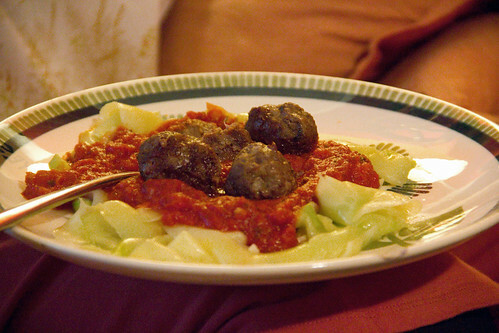 Last night we used up a particularly large zucchini, topped it with tomato sauce and homemade meat balls. The meatballs did have a handful of oats in them, but generally the meal was veggie-heavy, meat-light, and very easy on the body.